If you want to know everything about Venice events in 2019, you’re in the right place. Venice has always been an active city, where festivals, traditions, and exhibitions happen in all seasons, and 2019 will be no different. We have collected here all the events taking place in Venice during 2019, dividing them by season. Let’s start with the events you can attend in Venice in winter. Winter is not only Christmas time in Venice, but also Carnival time. From February 16 to March 5 Venice will be covered in confetti and streamers, and the bakeries will be full of Frittelle, Galani, and Castagnole. During Carnival, there are many events to attend, starting with the Venice Feast on the Water, that opens the Carnival season, the Flight of the Angel and the several masquerade balls organized inside majestic Venetian mansions. Don’t forget to add all these appointments to your agenda, because living Venice at Christmas and during Carnival is really unforgettable. Spring is the best time to visit Venice since the weather is sunny and pleasant and people feel comfortable being outside. Moreover, spring is the season of the Venice Biennale, and when many exhibitions open along with the Biennale collateral events. April is the month that celebrates St. Mark, protector of Venice, on the 25th. Get ready to see many red rose buds, because, on that day, Venetians celebrate love too. 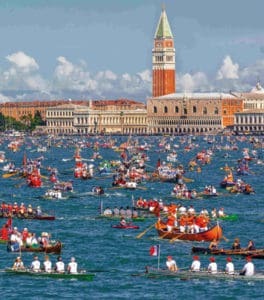 If you come to Venice in June, you’ll have the chance to attend one of the most important traditional Venice events: the Vogalonga rowing race. Summer is a time when many important events take place, such as the Sensa Festival, to remember the traditional marriage between Venice and the sea, and the Redentore Fest, a traditional festival in the city that Venetians care a lot about. On that day, you’ll see many boats sailing down the Grand Canal to reach St. Mark’s Basin, where they dock and wait for the firework display to start. Be sure to find a place to watch the fireworks for the Redentore in time, if you want to enjoy the show. Summer is also the time of the Venice International Film Festival, a mandatory appointment for all those who love movies and the red carpet. Last but not least, on the first Sunday of September, there’s another important rowing race called the Historical Regatta, an event that Venetians truly love. Fall is the season of traditions, in fact, on November 21st, Venetians celebrate the Madonna della Salute, remembering the terrific plague that brought Venice to its knees in the past. If you have the chance to feel what this event means for Venetian people, you’ll probably understand their deep feelings and culture. In October, before the day dedicated to the Madonna della Salute, the yearly marathon also takes place. Anyone can participate, including you and your family. Are you ready to pack your bags and come to Venice once for each of the four seasons?